Family Care provides assistance to the elderly and individuals with either developmental or physical disabilities at their homes rather than at long-term care facilities. These services are funded by Medicaid. Currently, Family Care is available in 57 of Wisconsin’s 72 counties. As of August 1, 2014, there were 41,510 people being served in the Family Care program. The state also offers the fee-for-service, self-directed IRIS (Include, Respect, I Self-Direct) program to provide individuals who qualify for Family Care services with an alternative to managed care. There are more than 11,500 participants in the IRIS program. Aging and Disability Resource Centers (ADRCs) - a single entry point where the elderly and people with disabilities and their families can access information, advice, and local resources available to them. The ADRC will help individuals determine eligibility and enroll in Family Care. Managed Care Organizations (MCOs) - manage, deliver, and tailor the Family Care benefit to individual needs and preferences. Despite the need and repeated requests from counties and advocates where Family Care it is not provided, the 2013-2015 budget did not include an expansion of Family Care to the remaining 15 counties. 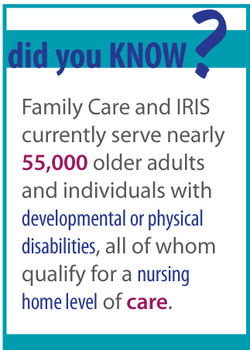 The Family Care and IRIS programs have greatly reduced state Medicaid spending on nursing homes because they empower program participants to self-direct their care in their own homes or more independent community-based settings. According the the Survival Coalition of Wisconsin Disability Organizations, these programs have helped reduce the proportion of the state Medicaid budget dedicated to nursing home reimbursement from 62% to 31% between 2002 and 2012. The Governor’s proposed budget would expand the Family Care program to all 72 counties in the state and cut Family Care funding by $14,336,900, which the administration believes will be offset by increased contributions from the additional counties joining the program. The proposed budget would also eliminate the separate IRIS (Include, Respect, I Self-Direct) program but specifies that individuals may self−direct their services within the Family Care program. Advocates for people with disabilities and older adults raised significant concerns that current IRIS participants would not have the same authority and flexibility to self-direct their care under the proposed Family Care model. For a more detailed comparison of the IRIS and Family Care programs, see this chart from the Save IRIS Coalition. In addition to expanding Family Care statewide and eliminating the IRIS program, the proposed budget included sweeping changes to the delivery of the Family Care program. There were significant concerns in the advocacy community that the proposed expansion program would be a pared down version of the current Family Care program. Under the proposed budget, administration of Family Care would be restructured from a regionalized, not-for-profit system to a statewide system open to for-profit insurers.This may force individuals to change their current doctors, caretakers, and even the group homes where they reside. As a result, advocacy organizations for older adults and people with disabilities are concerned that these changes could undermine the quality of long-term care that is currently available to program participants. The JFC approved the Governor's proposal to expand the Family Care program statewide, which means that the eight counties that currently do not participate in the Family Care program will do so by start of 2017. The JFC's proposal preserves the regional model of the program by mandating that there be at least five managed care regions, but opens the program up to be administered by private, for-profit insurance companies. The JFC gave the Department of Health Services (DHS) the authority to request a waiver from the federal government in order to get permission to implement any changes to the program. Before crafting the proposed waiver, DHS must consult with "stakeholders," but the JFC motion does not specify which stakeholders and in what manner they would be consulted. Many advocates remain concerned that, if enacted, the changes approved by the JFC will undermine many of the successful aspects of Wisconsin's long-term care system. The JFC proposal still provided a self-directed care option by folding the existing IRIS program into a managed care model, thus eliminating IRIS as a separate program. Advocates remained very concerned that self-directed care under a managed care model will be a very different reality for program participants than self-directed care under the current IRIS model. For an example of such concerns, here is a rundown of how self-directed care would be different under the IRIS program versus the Family Care program. The Governor's proposal would have dramatically changed the governance structure of Aging and Disability Resource Centers (ADRC's), which help people with disabilities and older adults navigate different benefit systems. The Governor's plan would have allowed the privatization of ADRC functions by providing DHS with the authority to eliminate county-run ADRCs and contracting out many of their functions to private, for-profit entities. Advocates were concerned that a privatized ADRC system would be less accessible and be potentially riddled with financial conflicts of interest. The JFC deleted the Governor’s recommendations, but required DHS to conduct a number of studies regarding the services provided by ADRC's and their governance structures. Because many of the changes to Wisconsin's long-term care system will require a waiver from the federal government, it is difficult to fully assess the JFC's actions. While many in the advocacy community continue to have significant concerns regarding these changes, much will depend on the DHS's engagement with stakeholders as the Department crafts the waiver request. The final details of the waiver request will likely hinge on which stakeholders are consulted and how much, if any, of their feedback is included in the final product. A mentioned above, the Joint Committee on Finance (JFC) altered the Governor’s proposal by requiring the Department of Health Services (DHS) to maintain at least five managed care regions. The Governor vetoed this requirement, which raised immediate concerns from advocates for people with disabilities that Wisconsin’s long-term care programs would be transitioned to a statewide model run by for-profit insurance companies, thus undermining the existing model that has worked very well for Wisconsinites with long-term care needs. Apart from a couple of other more minor vetoes, the final Family Care budget largely reflects the version that was passed by the JFC. For more detailed information regarding future of Wisconsin’s long-term care programs under the new model passed in the state budget, please see this Frequently Asked Question resource from the Survival Coalition of Wisconsin Disability Organizations. The changes to FamilyCare enacted in the budget are particularly important to elderly Wisconsin women, as they are more likely than their male counterparts to need long-term care services. Women over 65 are both more likely to have functional impediments that inhibit their ability to live independently and to lack a social network than men over 65. Furthermore, women live longer than men on average and make up a larger share of the over 65 population. This combination of disability prevalence, old age, and lack of support makes elderly women particularly in need of programs like IRIS. On the other side of long-term care equation, women make up 65% of caregivers and more than eight in ten are caring for a relative or friend age 50 or older, so any programmatic changes that undermine the ability of program participants to hire caregivers could have a negative economic impact on people working in that field.